Big dog pawrents take note, Apocaps CX Apoptogen Formula for Dogs and Everpup Ultimate Daily Dog Supplement is on sale this weekend! When you buy 3 bottles of Apocaps CX or EverPup, you’ll get 1 FREE. Of course you can also enjoy free Amazon SuperSaver shipping too! 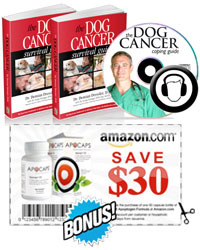 Apocaps CX Apoptogen Formula for Dogs is a nutritional immune support supplement created by Dr. Demian Dressler, founder of the Dog Cancer Survival Guide. Apocaps was created for dogs who are fighting cancer, because it utilizes natural plant-based substances such as Luteolin, Curcumin and Apigenin, which have been clinically shown to induce the body’s natural process of apoptosis. This process is simply the body’s natural method allowing of healthy cell death which enables new cells to grow, while keeping deadly cancer cells away. All the ingredients are human-grade and Apocaps is manufactured in the United States in an FDA-approved plant that manufactures human supplements. EverPup promotes dog health because it’s packed with 100% human-grade ingredients such as apoptogens, glucosamine, vital nutrients, probiotic digestive aids, and other superior ingredients like spirulina, curcumin and luteolin. Offer ends September 4, 2012. You must enter a quantity of at least 3 Apocaps or 3 EverPup jars to your cart and enter the corresponding code from above at checkout. Limit:one per customer.